BenQ W3000 review | What Hi-Fi? Around the £1000 mark, the decision to buy a TV or a projector may swing to the former. At that price you’ll probably get 4K and HDR - see our pick of the best TV deals - but can you get a 100in screen? No. Size matters, and while projectors may be dragging their heels when it comes to AV technology (at the time of writing, the only 4K, HDR model is Sony’s near-£9000 flagship) they remain the number one solution for big-screen thrills. 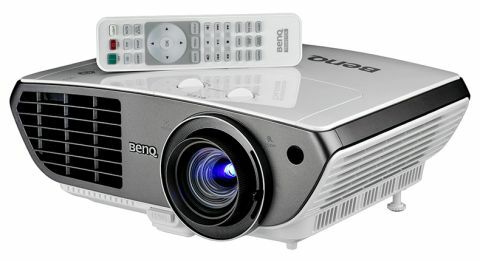 If your budget is modest (in projector terms) and you’re content with Blu-ray and high-definition video (or SD)), a 1080p DLP projector such as this BenQ W3000 could be the one for you. Like its sibling, the BenQ W2000, it uses the company's ‘Cinematic Colour’ technology, which means it’s calibrated to Rec. 709 colour space – an industry-wide colour reproduction standard for high-def TV. Curiously, the W3000’s 10:000:1 contrast ratio is lower than the W2000’s 15000:1, and it only matches it for brightness (2000 lumens). But it justifies its status with improved optics and picture processing under the CinemaMaster video engine umbrella (Motion Enhancer, Colour Enhancer and Pixel Enhancer); a bigger zoom (1.6x instead of 1.3x); and by adding horizontal lens shift to the W2000’s vertical one. They’re in the form of two dials on top of the unit and, alongside the on-lens focus and zoom control, they'll help you marry the picture to the screen. We’d use the test pattern in the projector’s menus as a handy guide, but first it’s important to sit the BenQ on a level surface near your screen (from 2.5m, it can project a 100in image), using the pop-out front foot and screwable back. If the W3000 is beaming off-angle, keystone adjustment will help square up picture. It’s all operated by the red-backlit remote, which is also used to change the picture settings. Whereas the W1100 and W2000 in the range feature flatter designs, the W3000 is more angular and has a more serious, business-like look about it, with a smart grey and white finish in place of the W2000’s gold one. Two HDMI, single PC and component inputs provide a hook-up to a home cinema amplifier or directly to a source, but plugging a Wireless HD transmitter (£200) into the W3000’s USB port can save you the hassle of trailing cables. Around the back is also a mini USB for servicing, as well as RCA and 3.5mm audio outputs. Once the BenQ is plugged in and set up, the last call of duty is picture settings. ‘Cinema’ is calibrated to Rec.709 – and is our preferred mode over ‘Game’, ‘Bright’ and ‘Vivid’. A whizz through the THX Optimizer disc sees us also tweak contrast, brightness and sharpness levels. Bumping up Noise Reduction and Pixel Enhancer too gets rid of the unwanted picture noise with a Blu-ray. We aren’t always fans of motion processing, but it’s necessary here for smoothing out judder. While ‘High’ gives it an artificial, smeary look, ‘Middle’ hits the spot, giving you a scene that’s smooth and absorbing. Once calibrated, we play Guardians Of The Galaxy on Blu-ray, and the fiercely etched lines and copious detail fill the screen – moss on Groot and fur on Rocket have convincing texture. But colours warrant special praise – skin tones are lifelike and the whole palette pops while maintaining a faithful balance. There’s plenty of tonal variance in Gamora’s green skin and Peter Quill’s red jacket. Blacks aren’t as deep as we’ve become accustomed to on OLED panels, but by projector standards, they are pretty convincing. While not the brightest we’ve seen, whites are sparkly clean and punch behind the film’s enthusiastic palette. DVD favourite The Lord Of The Rings: The Two Towers is a good advert for the BenQ’s upscaling talents – there’s barely evidence of a drop in quality. Edges are confident, and you can make out the fine detail in Gimli’s helmet. It maintains good depth perception too as hobbits climb against the vast mountainous backdrop. Those with 3D Blu-rays should be pleased to know that the BenQ maintains its crisp, clear picture while nailing the sense of immersion that 3D is all about – and that a pair of active 3D glasses are included. At this price, you’re probably using a home cinema amp and speakers, but BenQ also includes a built-in speaker powered by a 10W amp instead of the W2000’s 20W alternative. So long as you are sat within a few metres of it, it sounds loud and clear, with dialogue having no trouble poking its head above Howard Shore’s epic score. The BenQ W3000 may not be the most exciting or innovative AV product to come out this year, but it's a great way to supersize your screen at a relatively affordable price.